Have you turned on your air conditioner for the cooling season yet? Beware of the common errors that can play a role in your comfort during the warm months. While you may be tempted to let some ‘fresh air’ in on a cool spring or summer morning, you may be causing more harm than good. Not only could you be letting cool air out of your home, the unfiltered air could also irritate those who suffer from the effects of seasonal allergies. For these reasons, it is highly recommended that you close all windows and doors when the air conditioner is turned on. 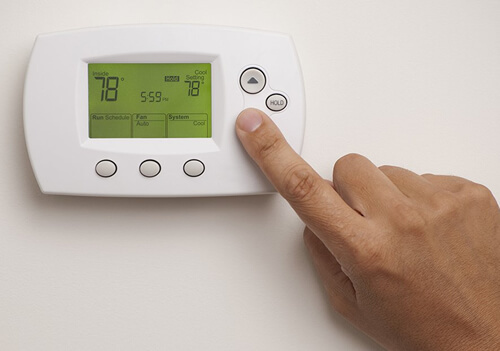 It’s true that you can save on your cooling usage by turning your thermostat up a couple of degrees while you are away from home; however, if you turn it up too much (5 degrees or more), you could be overworking your air conditioner to restore to the normal temperature when you return. Stick to a small margin of degree adjustments for ultimate comfort and savings. Your A/C needs monthly and yearly maintenance to ensure it is working properly. From regularly cleaning your air filter to scheduling seasonal tune-ups, you are more likely able to save yourself from the headache and financial burden of a breakdown by keeping up with routine maintenance for your cooling system. When it comes to your cooling system, bigger isn’t always better, and smaller isn’t always more economical. The wrong sized system could cost you! A system that is too large will cool your house quickly, but too many starts and stoops will shorten the life of your equipment and increase your utility bills. A system that is too small won’t get the job done either; a system that runs constantly may increase your energy consumption. Save yourself the frustration and make sure a new system is properly sized for your home. Many homeowners will wait until their HVAC system is very old and breaks down beyond repair before they decide to replace. However, what they may not know is that most system issues will occur during the hottest times of the year. Take control of the situation; save yourself the inconvenience and stress of an untimely breakdown and plan to replace BEFORE the system gives out.